A day after the Badgers' loss to Northwestern, sophomore Sam Dekker said of his team: "We're being soft. We're being unaggressive. We're being the team that's lacking in all the categories that you need to win." MADISON, Wis. — For as long as he’s been in a Wisconsin Badgers uniform, Sam Dekker hasn’t had a problem speaking his mind. Usually, the sophomore standout is cheery, content to discuss anything from his wide-ranging basketball shoe collection to the plight of his Milwaukee Brewers. But Dekker’s tone was much different Thursday after practice. Instead, he vented his frustrations with both his play and that of his team one day after a surprising 65-56 loss at home against Northwestern — the Badgers’ fourth conference loss in five games. And he acknowledged that perhaps it was time for an attitude shift. "I think you guys know that I like to be liked," Dekker said. "I like people having fun around me and stuff. If you want to be successful with stuff, you can’t be liked by everybody. It’s time to switch some stuff up." Dekker met with media members only after he had an animated post-practice sit-down with Badgers assistant coach Gary Close inside the Kohl Center. The meeting lasted nearly 45 minutes, with Dekker doing plenty of listening. "Coach Close expects a lot out of me and he’s a guy that I like to open up to a lot," Dekker said. "We talk a lot. He said, ‘Hey, enough is enough.’ You’ve got to be a leader. It’s time to stand up, be a man about it and go out there and do it. And you can’t just be talking. A lot of times teams just have a lot of guys saying hoorah and talking about it but not going out and doing it. I think it’s time for us to go out and do it." Dekker is the team’s leading scorer (14.0 points per game) and rebounder (6.4). But he also made just 2 of 9 shot attempts against Northwestern, and his body language during Thursday’s practice showed he was clearly frustrated. He said players needed to hold each other accountable, but only if it was done in a constructive way. "Right now, myself included, we’re doing a lot of finger pointing and doing a lot of ‘Woe is me’ type of stuff," Dekker said. "Just complaining, whether it’s officiating, not liking when coaches get on us, all that type of stuff. We’ve got to put that behind us. We’ve got to grow up. This isn’t middle school. This isn’t high school. This is high-level basketball, and people aren’t going to feel sorry for you or back down for you. "You can’t just think, ‘Hey, I’m talented, I’m pretty skilled, I can hit a jumper. Things are going to work for me.’ That takes work. And we’ve got to get back to knowing that it takes work and not thinking it’s going to fall in our laps. Obviously we found out here it’s not going to fall in our laps." No. 14 Wisconsin (17-4, 4-4 Big Ten) will find out whether any changes have been made in the team’s mental and physical toughness when it plays host to No. 24 Ohio State (16-5, 3-5) at 11 a.m. Saturday. The Buckeyes have lost five of their last six conference games, and both teams will be desperate for a victory to stay afloat in the Big Ten. Wisconsin was exceptionally poor offensively against Northwestern and made just 15 of 57 shots from the field (26.3 percent). At other times during Big Ten play, the Badgers’ defense has been the subject of much criticism — they allowed at least 70 points in five consecutive games. Badgers associate head coach Greg Gard said the team had gotten away from the things that have been staples in the program since Bo Ryan took over 13 seasons ago. 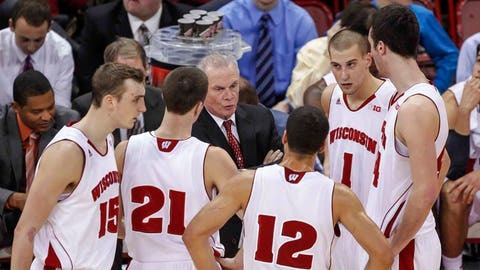 "Whenever you talk to anybody nationally about Wisconsin’s basketball program, (it’s), ‘Man those guys play hard. They get after you. They’re tough. They’ll beat you up. They’ll play physical,’" Gard said. "And that’s what we’ve got to continue to do. And sometimes with inexperienced guys, they don’t step into that and all of a sudden take on the same mantra that’s developed through the program. I think that’s the biggest thing is when we play hard, good things happen." 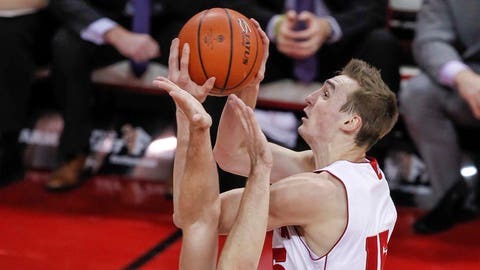 Dekker, too, acknowledged his team was not displaying the type of toughness necessary to succeed in one of the most difficult conferences in college basketball. We’ve got to be the exact opposite of what we’ve been the past few weeks. "I definitely think teams are taking advantage of what we’ve been lacking," Dekker said. "And that’s the past few games being focused, being ready, being prepared. These teams are coming in and punching us in the mouth and we’re not punching back. It’s simple as that. We’re being soft. We’re being unaggressive. We’re being the team that’s lacking in all the categories that you need to win." UW point guard Traevon Jackson was brief with his comments Thursday and said the time for talking was long gone. "I think teammates listen to when we see things by example," Jackson said. "That’s just Sam’s mentality, though. I love him because he wants to do the right things all the time. That’s where I come in. I have to back him up in terms of doing things, making sure those things can get done. The talk can come later." Wisconsin began the season 16-0 and rose as high as No. 3 in the national rankings. It marked the best start to a season in program history, and many pegged the Badgers as a viable Final Four threat. UW has never been to the Final Four under Ryan. Now, Wisconsin finds itself in a tie for fourth place in its own conference with Minnesota. And players continue to search for a way to make the freefall stop. "We’ve got to be the exact opposite," Dekker said, "of what we’ve been the past few weeks."